I have read on this board a few comments that made me wary of long shipping times. I got my cocktail kit very quickly. I ordered on December 2nd, and received delivery on December 17th. Shipping seemed very reasonable for such a large, & heavy package. In the evening on December 15th, I called to check on the shipping, having not received a tracking number. I left voicemail, and was emailed a few hours later that delivery was scheduled for the 17th. Good communication in my opinion. ALWAYS good to see a shop communicate with its patrons! 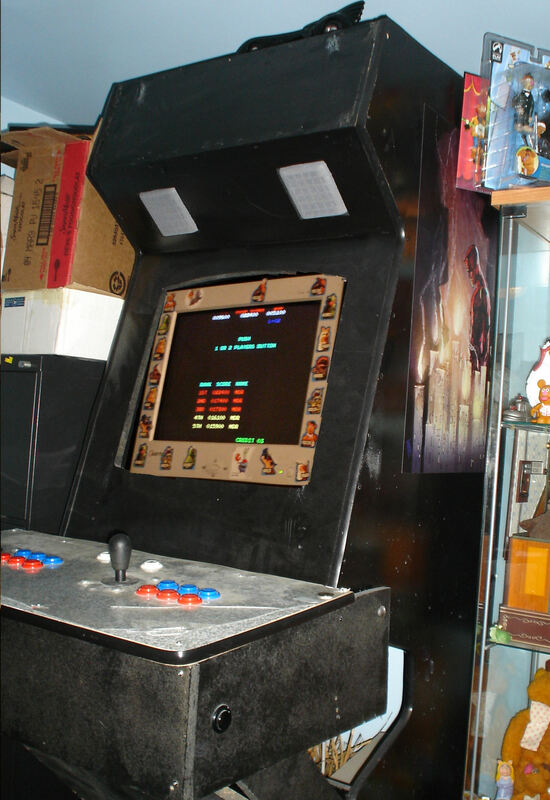 I also had great experience with arcade depot. the top of the coctail kit they sell by default is a ms pacman top. so I had them custom cut me a pacman coctail top which is in fact slightly different and they didnt charge me anything extra. They got it to me quick. it was nicely packed too. I emailed Sales@arcadedepot.com yesterday @ 9:00am and have not heard back from them. I had a couple questions. I even emailed from 2 different account in case it was getting filtered. Maybe I am just impatient but yikes on the communications! Hey Maybe I can ask you guys these questions? 1.) Does the third control panel option (TCP1) come with the Control Panel? Yes I know this sound like a stupid question but apparently there are control panel boxes and then just Control panels. 3.) I plan on using the vision pro 19" LCD. What are the options to mount this? 2 Days now and still no response from any of the 2 accounts I sent the email from. Does anyone know if there is a phone # I can call? 4-5 days and still no response. I really want to purchase a cocktail kit. Is there a more direct email that you used Kangum? I have not heard anything from arcadedepot.com. I called yesterday and left a message. I have not herd back yet. The voicemail I got didn't say anything about vacation or family emergency or anything. It was the standard voicemail. Still waiting! Anyone else want to recommend them while I am waiting? I've ordered 3 cocktail kits from arcadedepot over the years. No complaints here! Well that makes me feel better. When was the last time you ordered? Arcade Depot got back to me this morning. In the email I received it was explained to me a family emergency had come up and that they will be working on my cabinet with plans to have it finished by next week. I have to admit I was a little more than worried there for a bit. I just have to email them the cp and custom cut I need for the monitor. I've not done business with them recently, but I did build a cabinet from one of their kits many years ago, and it's still giong strong. I've been contemplating changing my control panels lately so another order may be in the works. 1.) Someone at arcadedepot has got packaging down to an art. Nothing was damaged that I could see doing a quick check and its not a surprise. I don't think it possible the way this was packed. You really have to see it to appreciate it. 2.) The poly coat was not dry and I will try and show it in the picture. When I removed the plastic it was kind of stuck and made a weird pattern. I am going to need to sand it down and apply another coat of Polly. Not a big deal to me. EDIT: It may just need a light sand. 3.) The quality is really really good. 4.) I am missing parts! Where are my control panels? All 3 are missing! do they come in another package? Why wasn't I told ahead of time? I sent Scott an email letting him know. EDIT: Scott got back to me and said there is a second package and that I should have it in a couple days. He also said that it should have been mentioned on the invoice. I will check the invoice when I get home this afternoon. Update: Scott has gotten back to me quickly the last couple emails and has even offered me a new cab. I refused of course as the poly coat being a little rough is not the end of the world and he provided me with info on the poly they used. I will update this as time goes on and I assemble the cab. Feel free to ask any questions. Well now its May 8th and no second box. I emailed Scott May 4th to inquire about a tracking #. No response. I emailed him again today. I really shouldn't have to keep after him . I can't assemble the cab without the control panels. Just out of curiousity what was the result of the above? I did get the second package the day I posted. The package label had a date of May 7th so it was just shipped. The third wooden control panel had a hole for the dowel pin that went through the routed area of the joystick so I had to drill a new hole for the dowel pin away from said area. Other than that it was good. I would compare my experience with arcadedepot to a Chinese restaurant with the best food but the worst customer service (Sorry for the sterotype) . Scott is great to deal with when you can get a hold of him or should I say when he wants to respond to you. I welcome any other questions. Oh and I mounted my LCD Dell LP2065. I took the monitor out of the plastic housing to do this. I will try and add a picture in a bit. I wanted to say thanks to piecesof8 for letting me use his control panel layout. I tried to build upon what he had learned and it saved me a lot of time. Here are some pictures of where I am right now. I don't want to start my own build project because its not really all that unique and piecesof8 did such a good write up on his. Looks good. Any pics of your final setup? Ok here are some vids of the cocktail table just about done the only thing missing are the spinners. Looks like some good progress there. Do you know what spinners you are going to use? I have a cocktail project that I am working on currently. No 3rd side. I am thinking of doing a similar control panel but swapping the joystick and spinner locations. This way the joystick will be closer to the center for joystick only games. Need to mock if up and test it out. I am using the same HyperSpin cocktail theme. It I'd amazing looking. Looks like you need to download the wheels for your regular MAME theme. Keep it up. I was thinking for the spinners I would get TurboTwist 2. Here is the thing about the third control panel. As for your comment about the joystick being closer to the center I wouldn't worry about it . It has never even crossed my mind when I play pac-man Also the Control panel is so small anyway that it doesn't really make a difference. cmoses - are you going lcd or crt? Because if you are going lcd you need one that can do custom refresh rates and also is s-ips so that it has good viewing angles. On a cocktail table viewing angles are everything. P.S. If anyone is wondering that glass is tinted solar gray and it does help the image a lot. Initially going LCD and MAME. I have a Dell 19" monitor that I plan to use. Viewing angles are really good as is the picture. I will be running MAME with a normal video card. I will also be using HLSL, which is part of MAME, to simulate scan lines and shadow mask. It is amazing how good it can look. I am keeping an eye out for a 19" TV that has s-video, but very hard to find. Not going for total authenticity. What ever works and can look good is fine with me. What type of monitor are you using? Are you using an ArcadeVGA card? I went with the HP LP2065 Monitor. I am running groovymame with a switchres program. Groovymame keeps the default resolution on the monitor put calls on the program called Powerstrip to change the refresh rate to whatever the game is. A lot of older games run @ odd refresh rates like 54 or something like that. I run a normal video card (not sure the exact model #) if that helps. Oh and I take back my comment about needing custom refresh rates. You don't really need them but they make the games run smooth. Most LCD do not do custom refresh rates far from 60. Hope this helps. Page created in 0.162 seconds with 44 queries.